The following post is from A2D CEO and Founder Stig Egard, as he describes an indulgent five days of decadent eating, eating and more eating in the coastal paradise of San Sebastián, Spain. Stig highlights “off the beaten path” favorites, local gems and popular eateries that have made this region a culinary destination for generations. San Sebastián is a bustling resort town on the Bay of Biscay in Spain’s mountainous Basque Country. During the summer months, the local beaches of Playa de la Concha and Playa de Ondarreta teem with visitors from nearly every corner of Europe, breathing international flavor into this bastion of Basque culture. These stunning Mediterranean beaches are framed by a picturesque promenade, graced by world-renowned restaurants that showcase the latest flavors and trends as envisioned by some of the world’s most innovative chefs. The cobblestoned old town (Parte Vieja) houses upscale shops and seductively vibrant pintxo bars that pair local wines with bite-size regional dishes. If you love tapas, you’ll love pinxtos! Why do so many great restaurants gather in this fortunate beachside enclave? Could it be that the Basque Culinary Center is also based in San Sebastián? The Basque Culinary Center is a culinary foundation created in 2009 by Mondragon University and a group of the best Basque chefs to build the region into a gastronomical superpower. It appears to be working. Before the summer was in full bloom, I decided to pay a visit to San Sebastián to refresh my memory and remind my palette of why I love this region so much. Arriving in San Sebastián, we unpacked our bags at the stunning Hotel Maria Cristina, a Luxury Collection hotel overlooking the Urumea River. A mere eight minutes from Playa La Concha, this belle epoque-era hotel offers decidedly elegant rooms with free Wi-Fi, flat-screen TVs and marble detailed bathrooms. It would prove to be a comfortable and welcoming home during my five-day stay. First on my gourmet agenda was Ibai, a basement level restaurant, run by 3 brothers, which captured the world’s attention in 2016 when Forbes listed Ibai as one of ‘The 16 Coolest Places to Eat.’ For more than 29 years, Ibai has been pleasantly surprising guests with creative dishes that reflect the history and culture of the region. Leave your credit cards at home, because this is a “cash only” dining establishment. Another quirk is that Ibai is only open for lunch during the weekdays. That’s right, Ibai is not open for dinner or weekends. Reservations must also be made in person. Despite all the hassle, there is rarely an open table in sight. I visited Ibai with my culinary friend Katherina, a chef from Georgia (USA). We were welcomed at the door and made to feel very welcome indeed. Within minutes, we were enjoying a delicious red wine from Rioja by Andres Romeo 2005 and tasting wild-foraged ceps with a perfectly prepared pan sauce and a roasted hake with parsley sauce, clams and kokotxas, stuffed baby squid with rich black ink sauce. Honestly, I felt honored to be sitting in one of only 22 seats in this institution of a restaurant. If I had to find one small problem with San Sebastián, it would be that eating more than one amazing meal a day is really too much for the average person. To eat two full meals a day in San Sebastián does not strain the budget as much as it strains the pants! To resolve this fortunate problem, my plan was to eat one full meal per day and then have a smaller bar meal visit. That was my plan. As you can imagine, even the best plans fall apart when temptation beckons. Later, as the early summer sun dipped below the horizon, I headed over to Casa Urola, owned and managed by chef Pablo and his lovely wife Begonia. As has become my tradition while in Basque country, I always start with 1 or 2 pintxos in the bar along with a glass of a wine. At 2.5 euros a glass, the Marques De Alella is an incredible value for a white wine. The red wine by same label was a bit disappointing, but the magic in the kitchen would soon distract my mind and my palette. Pablo is a master with charcoal-prepared vegetables, meat and fish, so I gave into temptation and sampled the grilled green peppers; crunchy and smoky with a pleasant charred flavor…an incredible fresh treat. For my main dish I chose the grilled monkfish with vegetables. It was light and full of rich, fresh notes…a truly memorable ending to an excellent first day in San Sebastián. Casa Urola is a winner and one of my favorites in San Sebastian. After a lazy morning at the beach, I headed out to Rekondo for lunch. Rekondo is a family run restaurant in San Sebastián with possibly the best wine list in the region or maybe even in all of Spain. A friend and colleague from Madrid joined me for lunch. Since Rekondo is his favorite restaurant in the area, he made the choices, which worked out perfectly. 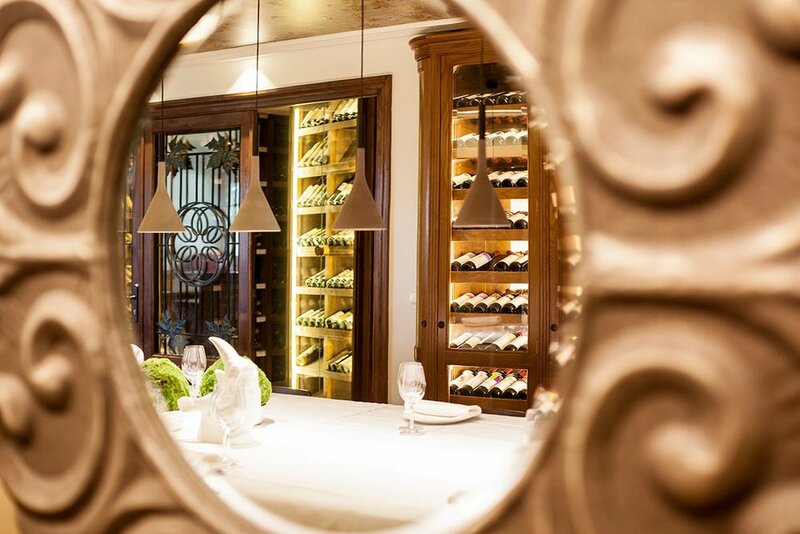 What makes Rekondo special, (aside from outstanding cuisine) is their Argentinian sommelier. He knows his business. While enjoying a delightful vintage, he shared a story about a recent visit by some wealthy hedge fund guys from New York who came to Rekondo willing to pay anything to taste the best wine. The sky was the limit. They gave the sommelier “carte blanche” to choose any wine he found suitable. Keep in mind that the bodega at Rekondo has cases of wine that could easily purchase an apartment in any major European city. After the meal the guests lavished the sommelier with praise for his wine selection, and then asked for the price for the bottle they consumed. When the sommelier brought out a bill for 37 euros, they were stunned. He could have charged them thousands and they would have gladly paid. Instead he showed them that quality does not always come with a sky high price tag. Sommeliers like this bring passion and honesty into an industry that is often recognized for snobbery. For dinner I went to Bokado, the only place where you can dine alfresco with a view of the beautiful bay of Biscay. Bokado has an excellent kitchen, and I thoroughly enjoyed the buttery filet of sole accompanied by fresh vegetables. It was the perfect dish for an evening meal under the stars, in the warm embrace of perfumed Mediterranean breezes. After another lazy morning, I took a taxi to the beautiful coastal town of Getaria. I try to always take the coastal route to soak up the beautiful scenery. This drive feels decadent, like eating chocolate while lounging around the pool. This stunning drive takes only 1 hour. When I arrive, I stroll purposefully through the village until I reach my favorite shop. True to my Norwegian heritage, my favorite shop is an anchovy store. That’s right…anchovies. My goal is simple…to bring some of the best anchovies home, so I can let the flavor of this trip sit on my tongue for at least a few more days. After a brisk walk, I work up an appetite before visiting Elkano, a family run restaurant that I have been coming to since my first visit to San Sebastián, what seems like ages ago. My order is always the same. Turbot and a glass of crisp chardonnay from the Osseano winery. Perfect as always. I spent the entire afternoon enjoying the charms of Getaria with an ulterior motive…to enjoy an early evening meal at Kaia, located near the port. Kaia offers a stunning view of the sea, but in the end, the view was not worth the frustration. Over the past 25 years of travel and dining, I have always carefully chosen the best restaurants, to give the best, first-hand reviews for my clients. Sadly, despite hearing great things about Kaia, I was disappointed almost immediately upon arrival. I was seated in a corner behind a wall while I waited for someone from the service team to notice me. Meanwhile, no less than ten waitresses stood together near the entrance, laughing and making jokes while their guests tested the limits of their patience. After waiting for more than was reasonable, I walked to the entrance area to place my order. It got worse from there. I decided to leave Kaia before placing the order for my main course. This experience underscores the importance of quality service. If the service is bad, no one will remember how great the food is. Halfway along the drive back to San Sebastián , I decided to experiment with another notable restaurant on my list. I decided to have my last dinner, (not to be confused with the last supper) at Ganbera, a great bar and pintxos hotspot upstairs with a tiny restaurant downstairs. I over-indulged with an excellent entrecote and made friends with the outstanding wine list by the glass, which tempted me with a Vega Sicilia Valbuena (5 years) from 2010 for 16 euros per glass, which is about the same as one would pay for a very ordinary Pinot Noir in a U.S. restaurant. Intent on continuing my over-indulgence, I ordered my favorite dessert of fried milky bread and vanilla ice cream. As I savored the first bite, I was reminded that I should not have dessert this late in the evening. But this is San Sebastián and indulgence is on every menu. Knowing that today was my last day in San Sebastián, I couldn’t leave without visiting my friends at Kokotxa before going home. Located in the middle of old town, chef Dani Lopez and his wife Estela, make magic every day before an audience of 50 enthusiastic diners. The restaurant itself has a well-earned Michelin star, thanks to Dani`s mesmerizing style and panache. We chose the market menu and were delighted as always. Honestly, for my money, I would rather eat at a pop up restaurant with Dani cooking than to have a multi-course spread at any number of “acclaimed” restaurants which litter the culinary guidebooks in major cities around the world, from Tokyo to Mexico. With Dani in the kitchen, I would truly follow him and his team just about anywhere. It’s time to talk about breakfast. Not just your ordinary breakfast…but breakfast so good, so original, that you remember it with a smile the whole day through and look forward to it again the next morning as you close your eyes to sleep. When I first arrived in San Sebastián , my friend Gabriela told me that she had an incredible breakfast in a bar called Gorriti nearly thirty years ago. Honestly, I passed by this place at least a hundred times and never paid it any mind. It’s located in the front of a market and looks like a cafeteria at a bus stop, so I never went in. Big mistake. During my five days in San Sebastián, I enjoyed breakfast here at Gorriti each morning, relishing every bite. Here, a tiny baguette is transformed with wild boar, pickles and spring onion and Bonito with anchovies and peppers. I was an addict. There’s no other way to explain it. Gorriti is one of the best local spots in San Sebastián and in my eyes the best place for pintxos. And in a region known for pintxos, being the best means something. After my last breakfast, I said my goodbyes, promised I would return again and headed home to my family in Antwerp.